In Sarawak, now you can, says HEIDI MUNAN, who finds a tour of the Liew Pepper Farm a fascinating trip. In Sarawak, it’s a job description. 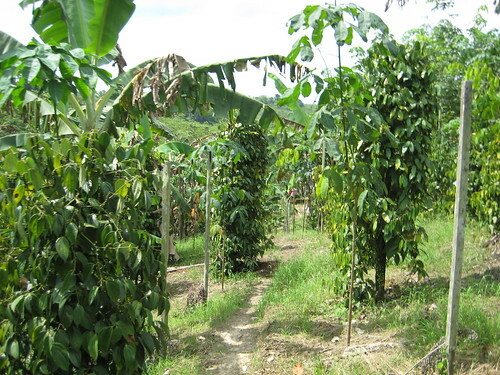 Some 67,000 farmers tend the lush green spice gardens on the fertile lowland slopes. Some of the world’s finest pepper grows right here, in Malaysia’s largest State. Tourists on their way to the almost obligatory longhouse trip see pepper gardens on both sides of the road as it winds its way from Kuching to Serian and on towards the Skrang, Lemanak and Ulu Ai rivers where most longhouses are located. Hearing all about it from a tour guide is one thing. Seeing it at first hand is quite another. This is what Mr Liew must have thought when he decided to open his farm to visitors. The standard longhouse tour starts from Kuching, with a lunch break at Lachau pasar. Liew’s farm is in exactly the right spot – hardly five minutes’ drive from the pasar, by the main road. Travellers can get out of the bus, stretch their legs a bit, look around the farm and learn all about pepper, and then proceed to lunch. Liew, like many pepper and vegetable farmers in Sarawak, is of Hakka descent, an adventurous people who came from China to West Borneo in search of gold, some as early as the 17th Century. Not all settled down. Large numbers drifted off to gold fields in other lands when the resource here seemed exhausted. But some Hakkas decided to make their home here, well aware that the good earth can yield other treasures, better than minerals! Pepper, black or white, is the product of a vine called Piper nigrum – remember Peter Piper who picked a peck of pickled pepper? The pepper fruit grows like a little grape. 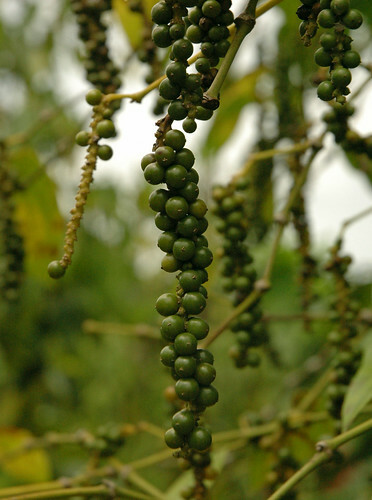 To make black pepper, the plump green berries are picked and sun-dried. The green seed skin turns black, this is why it’s called “black pepper”. White pepper production is a little more labour-intensive. The ripe berries are picked, soaked in water to soften the reddish skin and then rubbed on mats to expose the creamy white pepper corn. There’s more to pepper than growing and drying it. Only the best is fit for export, and the Pepper Marketing Board sets strict quality standards. Full, large grains are marketed as the top grade. The lighter stuff can still be used but it fetches a lower price. 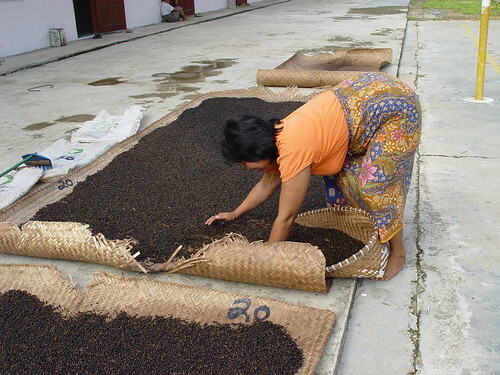 In the shady front porch of the farmhouse, a young worker demonstrates how the sun-dried pepper berries are sorted into “light” and “heavy”. The equipment used is called a spiral separator, basically a tin cylinder containing a spiral-shaped chute. A bucket of dried pepper berries is tipped into the top and centrifugal force does the rest. The sorted pepper grains fall into two buckets at the lower end of the spiral, the “heavy” to one side and “light” to the other. This brainchild of the Pepper Marketing Board’s technical department is a fine piece of non-polluting technology in the best do-it-yourself tradition! Most visitors buy a packet or two of guaranteed fresh pepper before they leave. A walk around Liew’s farm has given them just the right appetite to enjoy their lunch at Lachau, well sprinkled with Sarawak pepper. The farm is easy to find, just five minutes before Lachau, on the right side of the road if you’re coming from Kuching. A big sign says Liew’s Pepper Farm. Address: Rapak Lachau, Sri Aman. Tel 019-834 8927/019-894 1700.